Mandoliniste Bluegrass né le 15 Avril 1952 à Bowling Green (Kentucky). Bush was exposed to country music and bluegrass at an early age through his father's record collection and, later, by Flatt & Scruggs' television show. Buying his first mandolin at the age of 11, his musical interest was further piqued when he attended the Roanoke Bluegrass Festival in 1965. A child prodigy on the fiddle, he placed first at the national fiddle contest in Weister, ID, three times in a row. Together with childhood friends Wayne Stewart and Alan Munde, later of Country Gazette, he formed a band and recorded his first album, Poor Richard's Almanac, in 1969. The same year, he made his debut appearance on the Grand Ole Opry. Attending the Fiddlers Convention at Union Grove, NC, in 1970, Bush overheard the pioneering progressive bluegrass band the New Deal String Band. Inspired by their rock-flavored approach to bluegrass, he formed the New Grass Revival in 1972. Over the next 17 years, Bush and the New Grass Revival revolutionized the music of the hill country, incorporating everything from gospel and reggae to rock and modern jazz into their tradition-rooted sound. The New Grass Revival went through numerous personnel changes, with Bush remaining as the sole original member. Bassist and Vocalsist John Cowan joined in 1973, with banjo ace Béla Fleck and acoustic guitarist Pat Flynn being enlisted in the early '80s. In 1980, the group toured with Leon Russell, opening the shows and backing Russell during his headlining set. A live performance at the Perkins Palace in Pasadena, CA, was released as Leon Russell & the New Grass Revival: The Live Album in 1981. Beginning in 1980, Bush and Cowan periodically jammed with the Nashville-based Dockbusters Blues Band. Bush recorded his debut solo album, Late as Usual, four years later. In 1989, Bush and Fleck joined Mark O'Connor, Jerry Douglas, and Edgar Meyer in an all-star bluegrass band, Strength in Numbers, at the Telluride Bluegrass Festival in Colorado. When Fleck and Cowan elected to leave the New Grass Revival in 1989, Bush disbanded the group and joined Emmylou Harris' Nash Ramblers. He toured and recorded with Harris and the band for the next five years. In 1995, Bush worked as a sideman with Lyle Lovett and Bela Fleck's Flecktones. He formed his own band, featuring Cowan and ex-Nash Ramblers Jon Randall and Larry Atamanuick, shortly before recording his second solo album, Glamour & Grits, in 1996. He released his next album, Howlin' at the Moon, in 1998, with many of the same players and special guests, including Harris, Fleck and J.D. Crowe. In the winter of 1997, Bush and the New Grass Revival reunited for an appearance on The Conan O'Brien Show as the backup band for Garth Brooks. 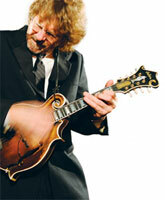 On March 28, 1998, Bush's hometown of Bowling Green, KY, honored him with a special "Sam Bush Day" celebration. Bush continued to be a much in-demand session player as the 21st century dawned, and continued to release solo projects. Ice Caps: Peaks of Telluride appeared in 2000 from Sugar Hill, followed by a collaboration with David Grisman, Hold On, We're Strummin', from Acoustic Disc in 2003. Two more solo efforts appeared from Sugar Hill, King of My World in 2004 and Laps in Seven in 2006. A year later his first live DVD, On the Road, was released and was followed in 2009 by the new studio album Circles Around Me.